When Does Praying In Public Make Others Uncomfortable? It’s often not when believers expect. In the United States, burkinis aren’t banned, but there are still clashes about whether religious freedom means the freedom to worship privately at church or the freedom to practice your faith in public. As a convert to Catholicism from atheism, I’ve been on both sides of awkwardness and discomfort around being religious in public. I usually decide what kinds of visible faith are too much based on my experiences from when I was an atheist, using them to make my best guess about how others feel. But that kind of guess offends my statistical sensibilities. So I commissioned a poll. To get a better sense of what religious practices make the nonreligious uncomfortable, I asked SurveyMonkey Audience to ask its panel to answer questions about acts of prayer that might be performed by an individual believer over the course of an ordinary day (praying the rosary on the bus, feeling led to pray for or with an acquaintance, etc.) rather than acts carried out by groups or the government (Nativity scenes at a courthouse, protests, etc. ).1 You can see the data from all the responses at our GitHub. Christians worried that their actions might cause offense, but they were often wrong about which actions were most likely to raise hackles. Even if a religious person isn’t praying for Silverman’s conversion, he feels backed into a corner. “If I say, ‘Thank you,’ I’m legitimizing their religion,” Silverman said. Ideally, he’d prefer religious people to to ask, “May I pray for you?” and to respect a “No,” if they get one. Rod Dreher, an Eastern Orthodox Christian and the author of “Crunchy Cons,” is cautious about who he offers to pray with, anticipating reactions like Silverman’s. But he’ll still privately pray for friends he cares about. For Dreher and many other Christians, prayer is part of loving someone, and he’d be treating his atheist friends badly if he neglected to pray for them the same way he does for his Christian ones. In Dreher’s experience, many Christians hold back from showing their faith in public out of fear of being rejected as much as fear of causing offense. In his interviews for his forthcoming book on the Benedict option, Dreher spoke to Christians trying to follow the example of St. Benedict, creating thicker ties between believers to give them the strength to engage the rest of the world. Many of the professionals Dreher spoke to were reluctant to out themselves as religious, but not all signs of religiosity spark discomfort. Christians overestimated how uncomfortable others were with seeing markers of faith. Only 57 percent of Christians thought an observer who spotted their religious clothes or jewelry would be untroubled, but nearly three-quarters of atheists and agnostics were unbothered. And it looks like I was right to feel OK about praying my rosary on the subway, assuming that, in New York City, it wouldn’t be the oddest thing someone saw that day. 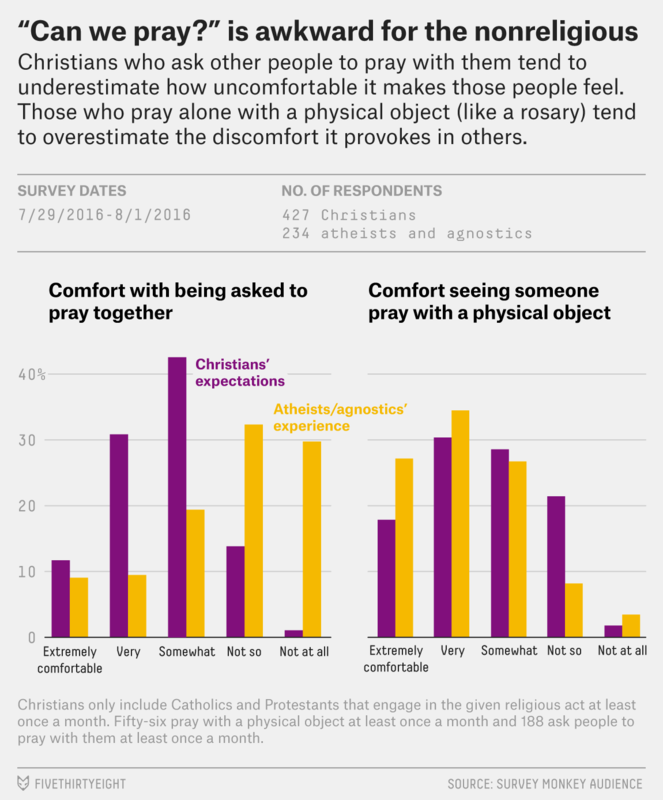 Sixty-two percent of atheists and agnostics nationwide felt very or extremely comfortable in these circumstances, but fewer than half (48 percent) of Christians who prayed this way guessed that an observer would feel that comfortable witnessing their prayer. But I haven’t found a good way to navigate saying grace in mixed groups, where it can feel like an implicit invitation to prayer. 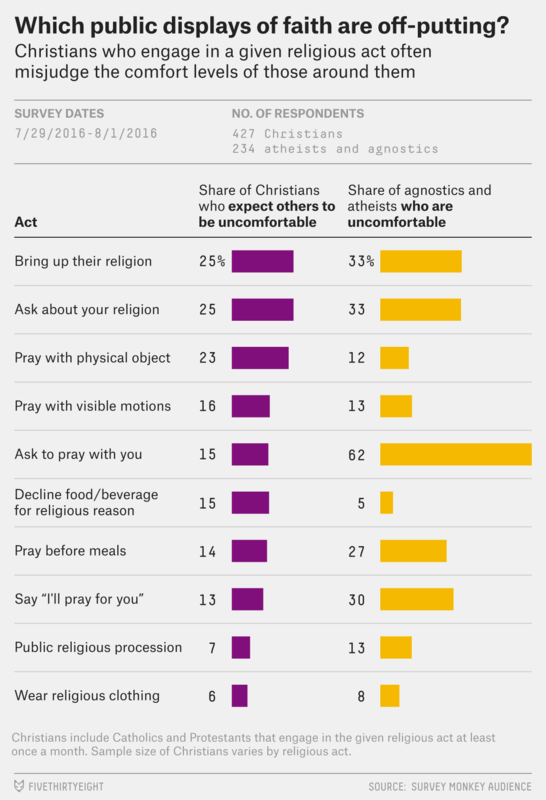 Nearly half of atheists and agnostics in the survey feel extremely or very uncomfortable when they eat with someone who says grace before meals. I’ve tried making my prayer invisible, crossing myself under the table or in the kitchen, but I wind up in my own head, thinking mostly about whether anyone can see me and not at all about God. Visible religiosity is tricky in some of the same ways that public displays of affection can be tricky: I don’t want to alienate friends or strangers by having them see something that makes them uncomfortable, but I also want to be able to reach out to or listen to God throughout my day, not just at church and in my home. But it’s hard to explain all that between the table being set and the forks being lifted. So, if I want to say grace or make any other public prayer that feels participatory, I need to have a lot of preparatory conversations with my friends (and a few with God). The survey included questions about a variety of faiths, but for questions about the expectations of religious practitioners, I reported only the results from Catholic and Protestant Christians (Mainline and Evangelical) because the sample size for many other faiths was too small to report on individually and would be swamped by Christian responses in the aggregate.